Hollywood celebrated the best in television Monday night! Meet the starlets topping my 2018 Emmys Best Dressed List. Oh, hey! I just wanted to give you a heads up that a little award show happened in Hollywood Monday night. Y’know, the Primetime Emmy Awards. A very small time and casual affair. While it definitely threw me off to have a major awards show take place on a Monday evening instead of Sunday, it sure was nice to indulge in wine and red carpet fashion after a long day at the office. In fact, I motion all major award shows now take place on a Monday. That way we have something look forward to on the worst day of the week. Timing aside – the nominations at the 2018 Emmys were no doubt STACKED. So much so that when I printed off a ballot for fun from Vanity Fair, I found myself stressing over it with a furrowed brow for quite some time. I mean, how can one honestly CHOOSE a favorite in the drama categories between Westworld, The Crown, The Handmaid’s Tale, Stranger Things and The Americans? Seems essentially impossible to me. Fortunately, when it came time to decide on my picks for the 2018 Emmys Best Dressed List I had a much easier time. The red carpet may have been overflowing with ladies, but when it came to looks that made me “Ooh” and “Ahh”…they were at a premium. If you live-tweeted the experience with me on Twitter, you may already have caught wind to who I was loving (and not loving) on this year’s red carpet…but for those who don’t? I’ve put together a list of 10 looks that stole the show…in my book, anyway. On that note, let’s get into it. 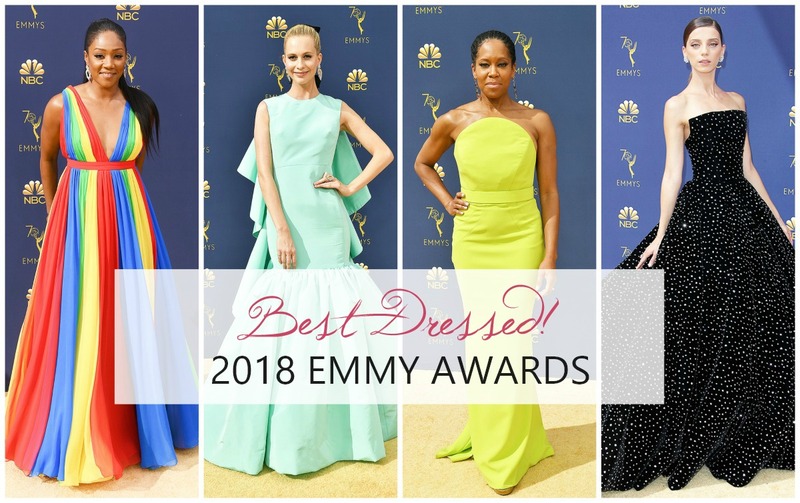 My picks for the ten Best Dressed ladies of the 2018 Primetime Emmys. From extra colorful to dressed in black, they really covered all the bases while looking flawless from head to toe! To start off my 2018 Emmys Best Dressed List – feast your eyes on the colorful Tiffany Haddish in custom Prabal Gurung. For anyone suffering a case of the Mondays (#OfficeSpaceForever), this was sure to give your spirits a pick me up. Of course it only helped matters that Tiffany was in a twirling mood and twirled her way through the red carpet. Go girl! Westworld is among my favorite shows ever and to see Angela Sarafyan take the opportunity to go SO BIG on the 2018 Emmy red carpet filled my heart with glee. 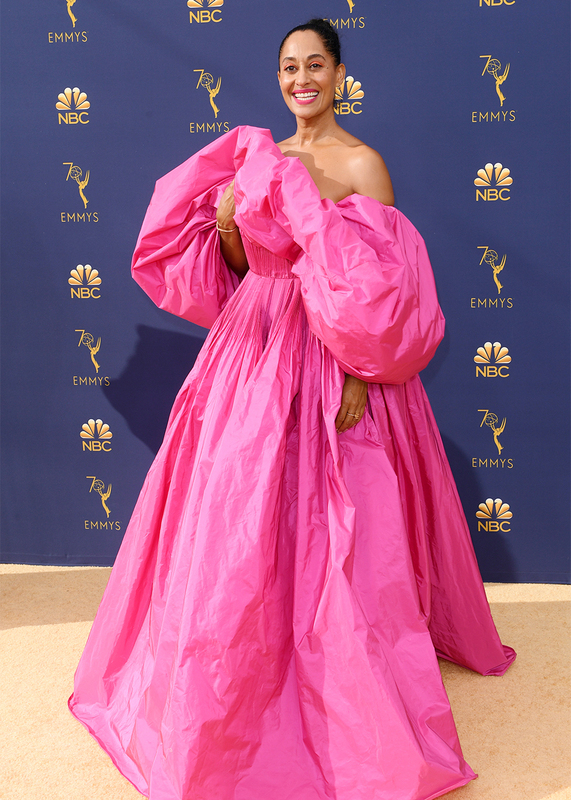 When I learned this was Christian Siriano I thought, “Of course!” – because he knows have to have fun more than just about any other designer out there and this is FUN on so many levels. Ever since 10 Things I Hate About You I’ve considered Allison Janney to be a queen and the 2018 Emmy red carpet was clearly no exception. Sparkly Prabal Gurung with a dramatic silhouette? SOLD!! Leading up to the 2018 Emmys the new season of American Horror Story debuted and Sarah Paulson unveiled yet another genius (and creepy) performance. There’s truly no end to this woman’s talent and to see her turn up looking like the Black Swan incarnated in this epic Oscar de la Renta is oh so fitting. Queen Sarah Paulson, I love you! I honestly have NO clue why model Poppy Delevingne turned up at the 2018 Primetime Emmy awards but I am absolutely NOT mad at it. This mint green ballgown is a dream come true. Ever since I was first introduced to Rachel Brosnahan in House of Cards I’ve had a bit of a girl crush on her and watching her take home in Emmy in this gorgeous Oscar de la Renta SS19 gown only sealed the deal. Truly, there’s nothing more eye catching on a red carpet than a poppy shade of yellow and Regina King pulls this Christian Siriano off with such class. For years now I’ve been waiting for Regina’s talents to be recognized by the Hollywood powers that be and watching her take home the gold in this flawless gown was truly a JOY. This year, Kristen Bell proved that a simple statement is often a statement above the rest in this crisp white gown. Anyone who’s kept an eye on the red carpet of late knows that Tracee Ellis Ross is one SERIOUS fashionista. And while it breaks my heart that she didn’t go home a winner for Best Lead Actress in a Comedy – she absolutely went home a winner as Best Dressed in this Valentino confection. I publish new posts every week. Stay up-to-date and receive inspiration straight in your inbox by joining my mailing list. I’d absolutely love to have you along for the ride!